Add a burst of cheerful color to an outdoor space by planting sunflowers (Helianthus annuus). These sunny annuals adapt well to growing in containers, making it possible to grow beautiful flowers even without a garden. All you need is a large container and a spot that receives at least six to eight hours of direct sun exposure daily. Sunflowers grow well in U.S. Department of Agriculture plant hardiness zones 2 through 11. Gardeners can save seeds from the flowers to plant the following year. In general, sunflowers need plenty of space to grow. Look for a container with a diameter of 18 inches or larger. If you choose to grow a giant sunflower variety, choose a planter with a diameter of 24 inches. The container should also have a few drainage holes on the bottom to prevent the sunflowers from becoming waterlogged. If the container doesn’t have at least one drainage hole, drill three to five 1/4-inch holes in the bottom. You can grow nearly any sunflower variety in a container as long as you use a pot that's large enough to accommodate it. Gardeners with smaller spaces can choose from compact varieties such as "Big Smile," which grows 10 to 24 inches tall with 3- to 6-inch flowers, and "Little Becka," which grows about 3 feet tall with 6-inch bi-color red and yellow flowers. Thanks to its sturdy stems, towering 12-foot "Giganteus" doesn't need to be staked. Other tall varieties include "Lemon Queen," which grows 6 feet tall and attracts bees to the garden. Because sunflowers grow quickly, there's no need to start the seeds indoors. Wait until the danger of frost has passed and fill the container with potting mix combined with 3 to 4 inches of compost to give the seeds a boost of nutrients. Sow sunflower seeds approximately 2 inches deep and 6 inches apart. Cover the seeds with potting mix and water the container thoroughly. Maintain evenly moist soil during the first seven to 10 days. Once the seedlings develop a second set of leaves, thin the plants to allow 2 to 3 feet of space, depending on the variety. Once you have thinned the seedlings, spread a 2- to 3-inch layer of bark mulch or another type of organic mulch on top of the soil to help conserve moisture. Sunflowers grown in containers dry out faster than flowers grown in the ground. Allow the soil to dry out slightly between watering, but check the soil every few days to prevent the container from drying out completely, particularly during hot, dry spells. Add a trellis, stake or another type of support for any sunflowers that grow taller than 3 feet. As the flowers grow, tie them to the support with strips of soft material. Fertilize young sunflower plants every two weeks or so. Mix liquid 10-15-10 fertilizer at a rate of 7 drops per quart of water and apply it to the soil. 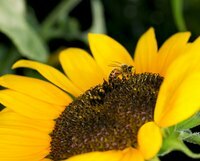 Although sunflowers are relatively free of pests and diseases, watch out for the sunflower moth, a small gray insect that lays eggs in the flowers. Kill the larvae, which have yellow-green bodies with brown stripes on the back, by picking them off the plant. If squirrels and birds become a nuisance by eating the seeds from the flower, place a net over the flowers or around the container. Watch for pale areas or fuzzy mold growth on the underside of leaves, which may indicate downy mildew, a fungal disease that can infect sunflowers. Avoiding overhead watering can minimize the likelihood of developing a fungal disease. If problems develop, spray the plant with a general garden fungicide.